VIDEO: 'Watch Me Whip,' Says House Decked Out For Halloween : The Two-Way For several years, the owners of a Maryland house have synchronized lights to music, from Halloween favorites like Michael Jackson's "Thriller" to more recent hits. A house in Odenton, Md., uses thousands of lights to sing and dance along to popular songs — like Silento's "Watch Me (Whip/Nae Nae)." It sings; it dances; it shines — all with the help of thousands of lights and some scarily infectious music. 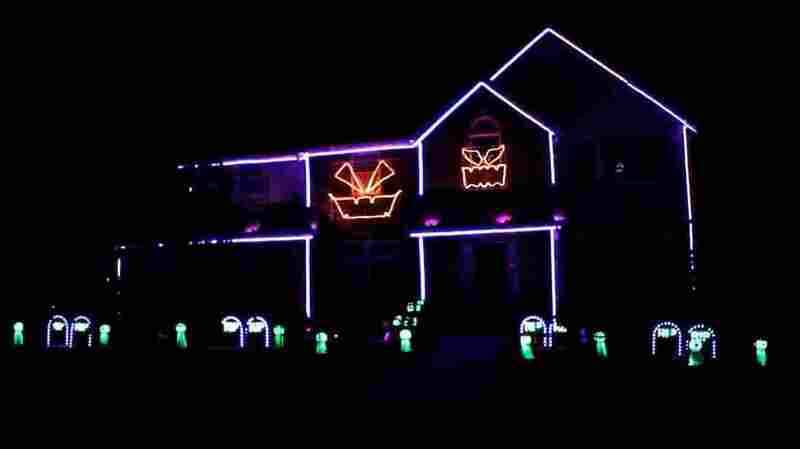 Known for their holiday light shows, the owners of a Maryland house are using lights to create animated jack-o-lanterns that sing along to Michael Jackson's "Thriller" and other hits. This year's mix includes "Watch Me (Whip/Nae Nae)" by Silentó; the song became ubiquitous this summer, with its official video racking up more than 336 million views after arriving on YouTube in June. And now, a week before Halloween, it's the soundtrack centerpiece for the two-story house in Odenton, Md. that's become a popular holiday stop for spectators. For several years, the house has blended Halloween favorites like "Thriller" along with more recent music. By featuring "Watch Me (Whip/Nae Nae)" this year, The Root reports, "the light show is set to one song that many people just never want to hear again." But they might come anyway, drawn to the house on Ice Crystal Court by a recent Facebook post by Bryan Hagan and his family. The shows start around dusk and run until 9 p.m., according to a recent post. The Hagans urge people watching the show to stay in their cars, where they can use their radios to tune in to the music. In interviews, Hagan, who also puts on a large Christmas show, has said his two children and neighbors pitch in to help put on the shows — but the hardest part, he said, is syncing up the lights and the music. "I actually have to take the lyrics to the song and program each face to basically sing the lyrics," Hagan told the Capital Gazette last year. "That part is what takes the longest. A 30-minute song takes probably about eight hours of work to program."